Roller derby is fast paced contact sport played on quad roller skates, flat oval track in a counter clockwise direction. A game consists of two 30 minute periods and these 30 minutes are made up of jams which last 2 minutes. Each team fields five members - 4 blockers and 1 jammer. - It is the jammers’ job to get through the pack of opposing blockers. On their initial pass no points are scored, on their second lap they gain points by passing opposing skaters. The jammer who breaks through the pack first is Lead Jammer and possesses the ability to call off the jam before the 2 minutes are up. - It is the blockers’ job to defend against the opposing jammer and provide offence against the opposing blockers to get their jammer through. And as much as we love Whip It… no, we do not elbow or kick each other (intentionally!). 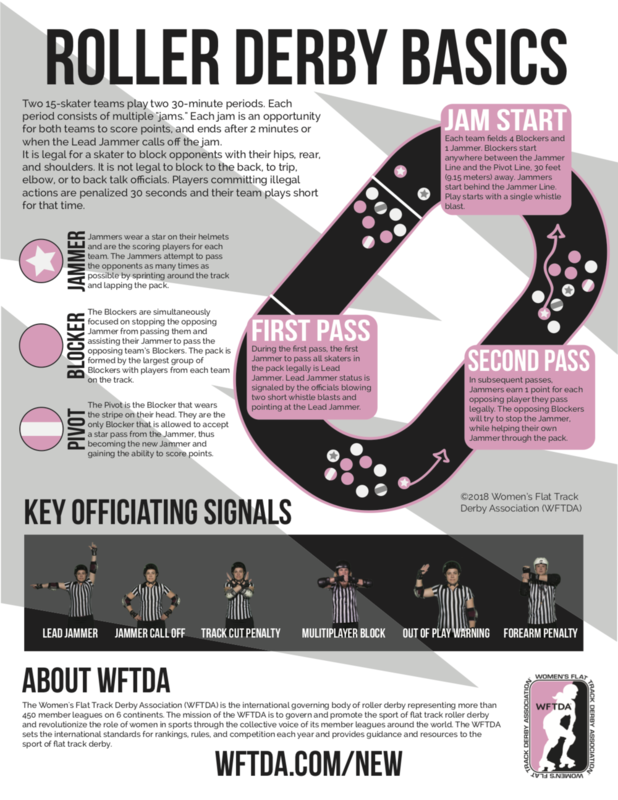 Roller derby has many rules to make game play as safe as possible. The game is won by the team that has accumulated the most points at the end.